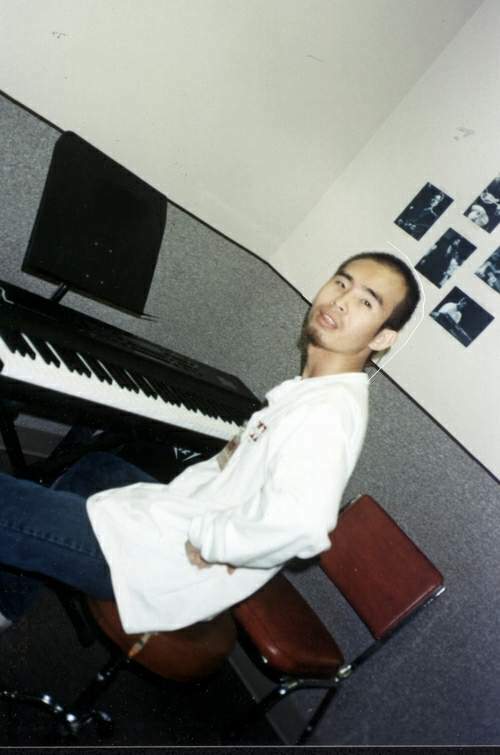 me and keyboard(1996), My mother is a pianist, I've heard her playing almost all my life, and makes piano the first instrument of my life. But I don't claim myself as a good pianist, otherwise I'm pretty basic at it. Never learn seriously and never practice. I like Bach, Mozart, Debussy.......no..no..no..I don't play it, I just listen. I've been working on Bach's "inventions" but I give up, I'd prefer working on my drums independence. 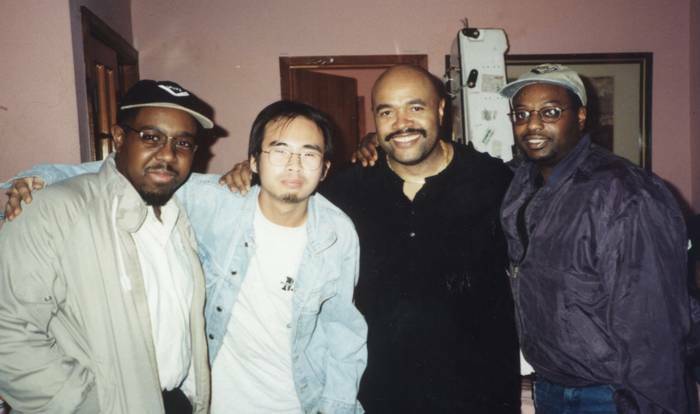 me, dennis, mr. marvin and fred (Catalina Bar, Los Angeles, 1995) Dennis Chambers, Marvin "smithy" Smith, and Fred Dinkins....these guys are groover. 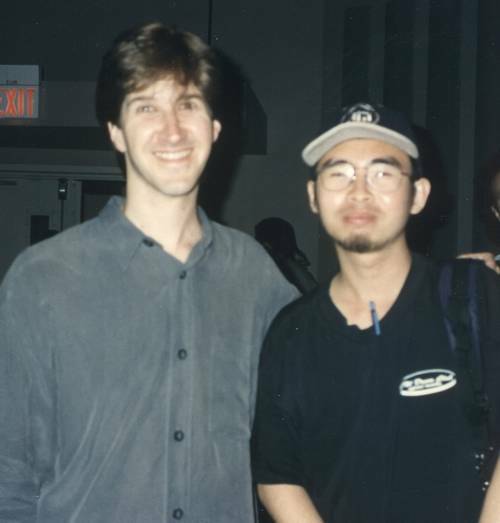 me and Chad Wackerman (Musicians Institute, Hollywood, CA, 1995) I went to his drum clinic at the school. Lots of odd meter, cool. 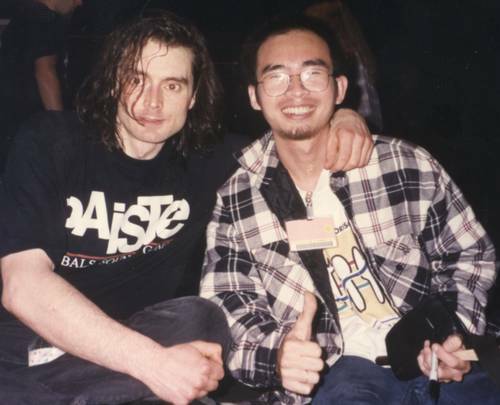 me and Virgil Donati (Musicians Institute, Hollywood, CA, 1995) I knew him long before he moved to states. Amazing double pedal work. 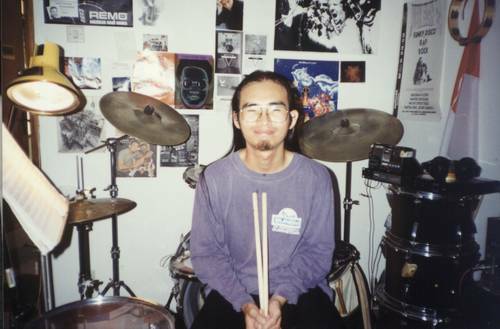 my working room (Yogyakarta, 1992) When I was in the college (it was in another town), I rent a small house and set my training pad into a electronic drum, to keep the quiet neighborhood. The "classic" drummers issue. I used trigger mike, and Yamaha TMX as a modul (you can see it on my left). 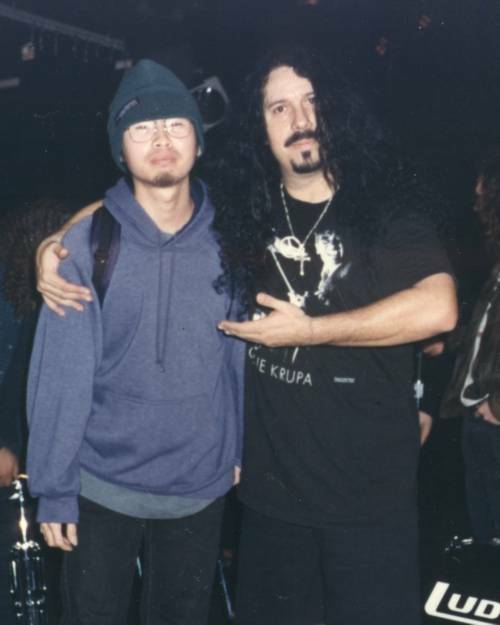 me and Frankie Banali (Musicians Institute, Hollywood, CA, 1995) Is anybody know who is he? Not too much student knew him, when he played at my school....but I know him well. 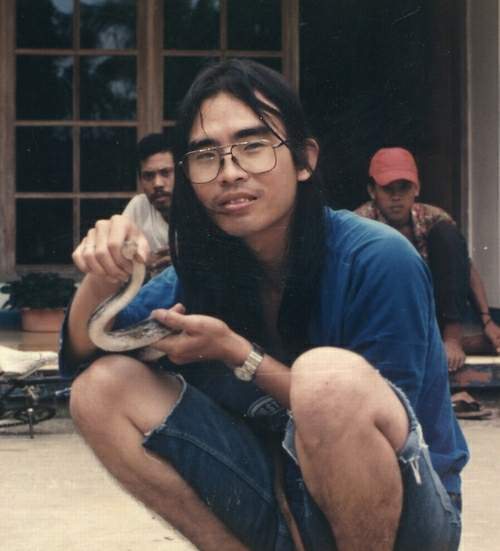 I "grew up" with him and his group, when I was a junior high school. Quiet Riot....ROCKS!!! Actually, he is one of some drummers up there, that made my reason to play drums. Love you, Frankie...and, told you, he is a nice guy, if you ever have chance to meet him, don't hesitate, talk to him. 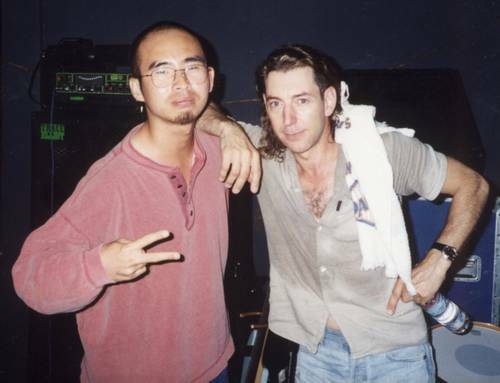 me and Simon Phillips(Baked Potatoes, LA, 1995) He play with David Garfield that night, what else can I say? O ya.....he broke one of his crash cymbals. And here's him on the stage. It was a very small stage, and I seat, just next to his floor tom. I can feel his strong spirit in the air. 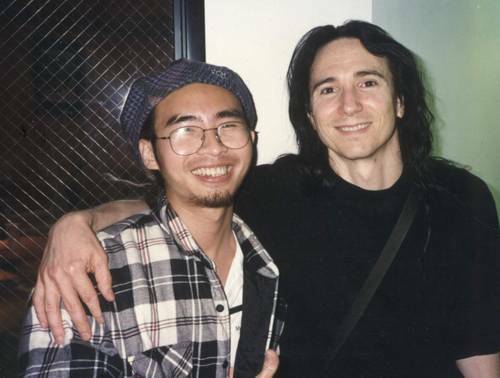 me and Terry Bozzio (Musicians Institute, Hollywood, CA, 1995) One of my favorite drummers. 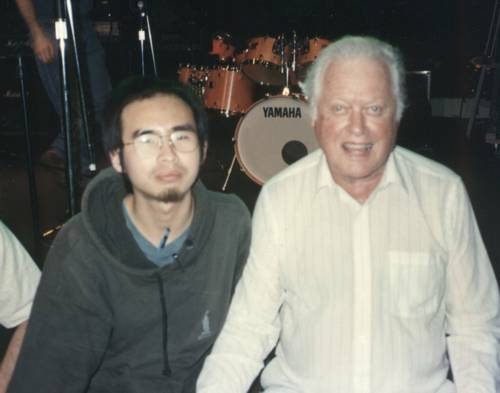 me and Jim Chapin (NAMM show, Anaheim, CA, 1995) I hope I could be like him. More than 60 years of drumming...wow! 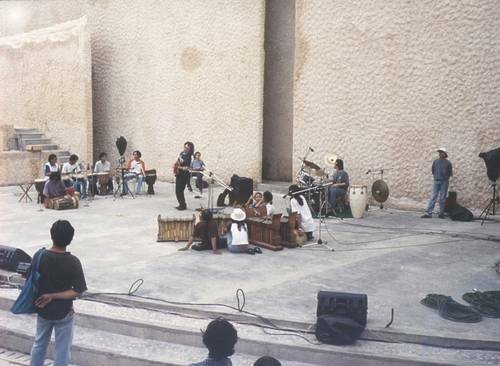 the "WORDLESS" session (Bali, GWK amphitheatre, end of 1999) The jam session between 4 players of balinese traditional percussion, ( the instrument called : gender and gamelan), 5 players of afro-latin percussion (jembe, shekere, conga, etc) 1 bass player, 1 keys and flute player, and myself play drums and conga. It's a free form improvisations, and we have conversations through music and rhythm. That's why I called it "WORDLESS". 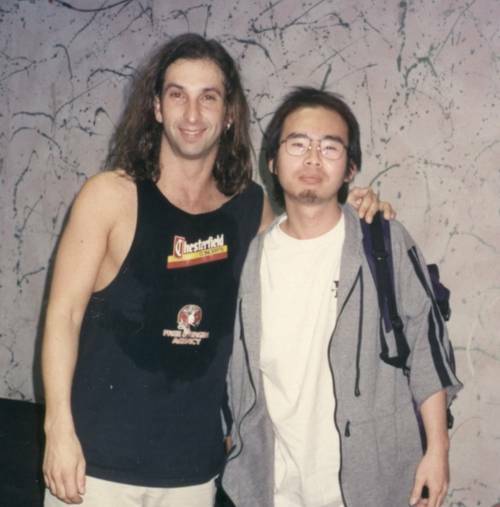 me and Toss Panos (Musicians Institute, Hollywood, CA, 1995) Mr. Toss Panos plays Jazz as good as he plays Rock, he got style. 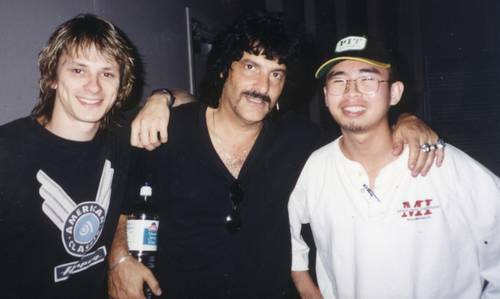 me, Ray Luzier and Carmine Appice (Musicians Institute, Hollywood, CA, 1995) Ray Luzier teach "ROCK Class" and mr. Carmine Appice....he teach everybody. 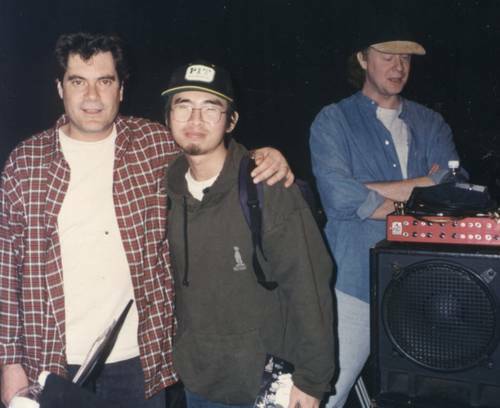 me and friends(NAMM Show, Anaheim, CA, 1995) I'm telling you, it's good to be a drummer. You'll get friends from all around the world. Why? Because we speak the same language, we are witnessed to the same life story and we dreamt the same dream. This is Yusuke (the taller one) and Chihiro (the smaller one) from Japan. And a note for this "Chihiro" he is one of that you called a "prodigy", or "Whiz-kid" or "virtuoso" you name it.....he is the one hell of that gifted people. 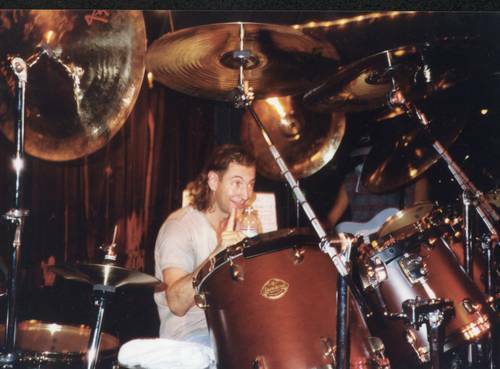 You listen to his drumming, and you'll understand. Now he live in Japan, I don't know, whether he's recording anything yet, but damn sure he still playing somewhere. 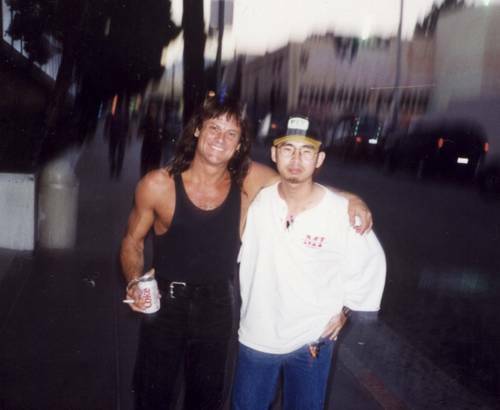 me and Tris Imboden (Musicians Institute, Hollywood, CA, 1995) Tris Imboden and his group played salsa and latin, and it was orgasmic. He moved the entire building, and everybodies in the hall. It's awesome!! 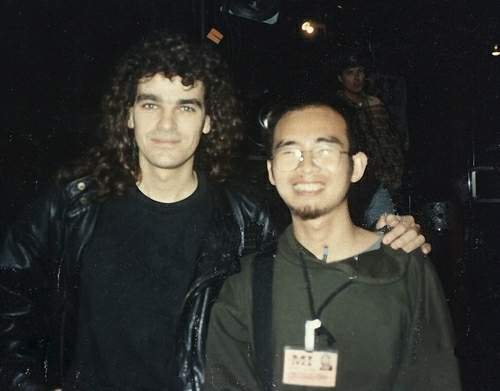 me, Carlos Vega and Doane Perry (Musicians Institute, Hollywood, CA, 1995) in memoriam, mr. Carlos Vega. He played with "KHARIZMA" that night. And mr. Doane Perry (from "Jethro Tull") was one of the audience. 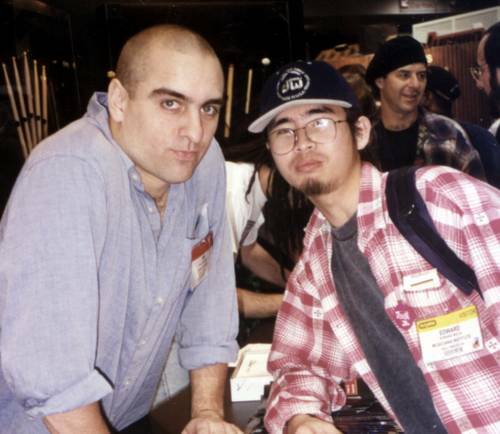 me and Tim "Herb" Alexandre (NAMM show, Anaheim, CA, 1995) I went to NAMM, it's a yearly exhibitions of all Intrument Music Factory, Recording Company, Musical Stuff, all music related stuff, from all around the world. And I assure you, the area was "LARGE" , and this is my first time (first time always good). 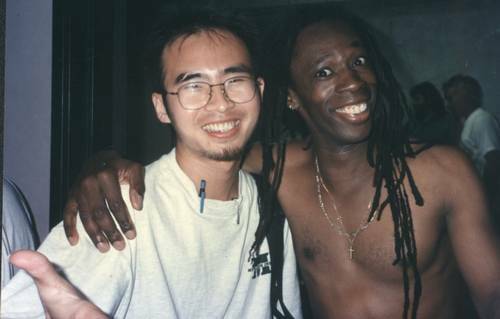 I've met many musicians, hall of fame there. I like Tim's style on Primus, and also have heard his side project : Laundry. 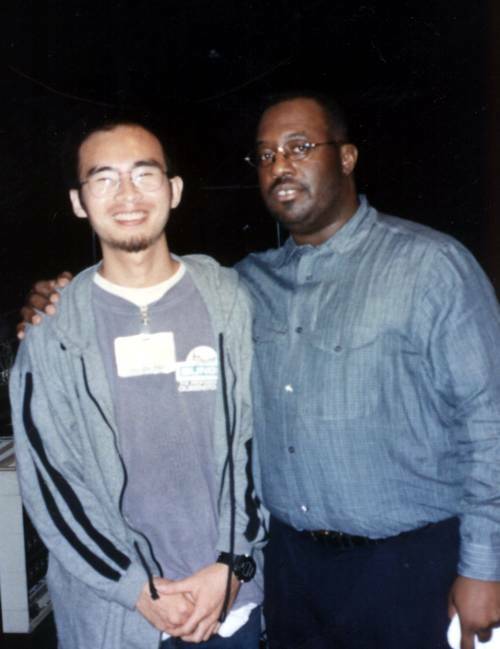 me and Carl Allen (Musicians Institute, Hollywood, CA, 1995) He play soft, he play hard. This man is the King of dynamics. 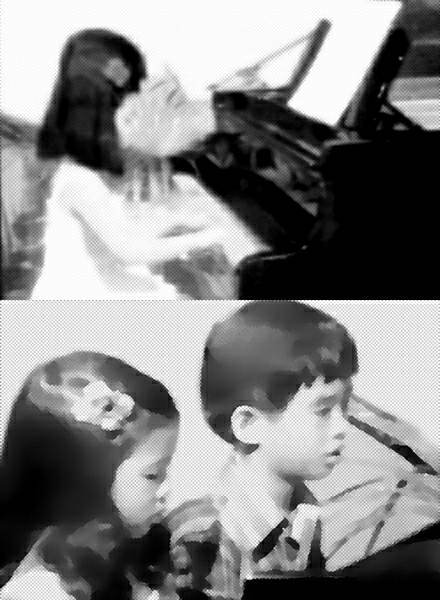 me and my sister (denpasar, around 1975 to 1977) there was a local TV programme called "DILETANSIA" showing classical music, play live on studio and play piano duet with my sister. There was no video recorder nor color TV, my father take photograph from the TV screen. You can visit my sister's homepage by clicking here : www.wulia.com , she won international prize for her short movie (2002) in australia www.mafia.com.au/awards/finalists/slambang.html.